I had almost forgotten what a joy it was to watch young Little owls being fed and learning how to fly. 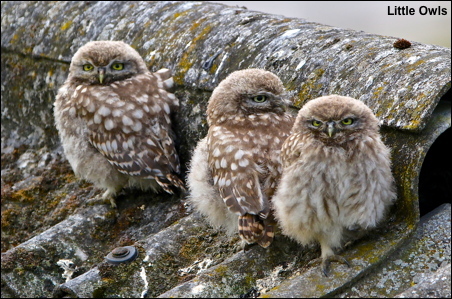 Several visits have been made to an old barn where I found a family of young owls. At times the young owls flew to within five feet of the car and provided me with some delightful photos. Click here. Sadly in recent years my local Little Owls have disappeared from several locations which I put down to the massive increase in the number of Buzzards. After last weeks photos of a male Long Eared Owl I have been asked how did I know it was a male as there is no discernible difference between the plumage of the sexes. Luckily, when I found the nest earlier the female was on the nest and looked down at me with yellow eyes. As soon as the young Owls fledge the nest they are usually fed by the male who had deep orange eyes. The eye colour of Long Eared Owls differs considerably and during the winter of 1976 I was lucky enough to catch 6 Long Eared Owls in a mist net, for ringing purposes and each one of them had different shades of orange/yellow eyes.